Update 12:00PM 7/7: New Honda Showroom will be available at Litt Tak Sg. Wang this coming Friday. Limited units are available, estimated selling price is RM69.90. are the displayed cars provided or is it an empty show room? btw, i read somewhere that they are coming out with a limited edition civic type r, is that true? do you know where else i can buy the current type r besides litt tak? The Showroom does not come with any cars. Civic Type R is hot model, it have been sold out quite some time, I have not seen any so far. 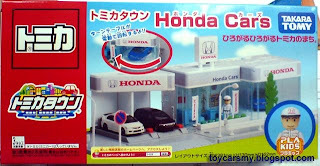 I'm sourcing it overseas, will post it to toycarsbay once i got it. uy the hoda civic type r at malaysia....can i buy it at midvalley jusco. I'm wan buy,, please.. Do contact!